After the six-month academic and familiarisation training programme, the XS-11 were ready to begin their year-long pilot training course. The new group had been selected in the aftermath of the Apollo 1 pad fire in January 1967, and the space programme was changing as a result. In addition, they were out of the research laboratories and many were falling seriously behind in their own science work. Adding to their frustration, the new group of scientist-astronauts had tried to convince Air Force authorities to conduct their training at a single, suitable base, but this was denied as impractical. They would be sent to military air bases already stretched to the limit by the growing war in Vietnam. Apart from Phil Chapman, only one of the group, Story Musgrave, had ever piloted an aircraft before, and none had flown ajet aircraft. With the exception of Don Holmquest, who would join the group a little later, they were sent to flight schools at several USAF bases all over Arizona, Oklahoma and Texas, beginning their training in March or April 1968. After completing their Air Force training, the astronaut pilots would then be expected to maintain their flight proficiency in NASA's fleet of nimble T-38 aircraft. This proficiency would include acrobatic, instrument, formation, cross-country and experimental flights. They would also receive periodic and individually-requested performance honing from NASA's pilot-instructors, and they would undertake written examinations on aircraft performance and systems, procedures and regulations. Oral and flight examinations would take place every six months. 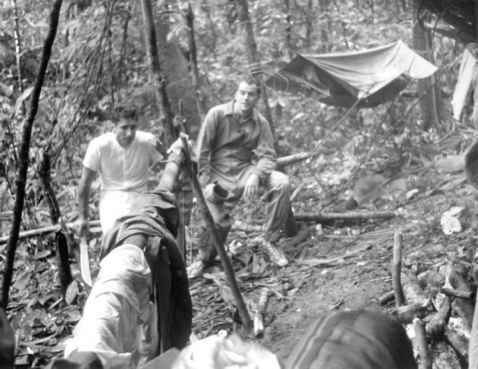 Brian O'Leary and Bob Parker were sent to Williams Air Force Base (AFB) in Phoenix, Arizona, where they would begin their flight training with nearly eighty air force officers, many of whom would be shipped over to Vietnam once their training was ended. The two men felt conspicuous and awkward in their civilian suits, especially O'Leary, the only man wearing spectacles. He was extremely out of place and very uncomfortable with the whole process, and had already entertained the idea of quitting the astronaut corps. 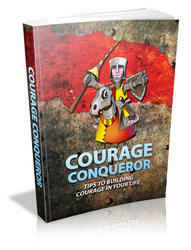 But he'd decided to give himself a chance, reasoning that he might even surprise himself and become a good pilot. In O'Leary's case, these words would certainly ring true. To make matters worse, he and Parker were separated and placed into two classes of about forty men. Each morning, beginning at 7:00 a.m., one group would receive flight instruction while the other group attended classes at the Casa Grande airport, fifty miles away. In the afternoon they would change places, and in the evenings they spent several hours studying what they had learned, knowing they could be quizzed at any time and had to know the right answers. On average, each trainee flew one hour a day, four days a week. Flight training began with six weeks in a version of the relatively uncomplicated Cessna 150, a single-engine high-wing aircraft that is also commonly used in civilian flight schools. The principal purpose of this phase was to identify, at minimum cost and risk, any students who had little chance of completing the course. Chapman had no difficulty, especially as the Cessna was not very different from aircraft he had flown before. The surviving students then moved on to a subsonic T-37 jet trainer, affectionately known as the 'Tweety-Bird' because of its whistling engines, and finally to the supersonic T-38 Talon, a two-seat training jet aircraft. NASA owned a fleet of these T-38s, which were used by all existing astronauts. 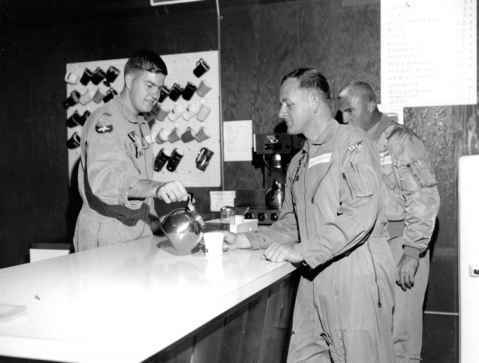 Chapman has a coffee break in the lounge of the 3516th Pilot Training Squadron at Randolph AFB. Pouring the coffee is 2nd Lt. Paul Cunningham, while behind Chapman is instructor pilot Major Charles Herning. Bill Thornton had to take a little longer to complete his flight training. On 10 June 1969, NASA announced that the scientist-astronaut's graduation from jet pilot school would be delayed by an eye problem. An evaluation of his vision indicated that he should be fitted with specially designed eyeglasses which would allow him to achieve the degree of stereoscopic vision required for certain piloting manoeuvres. Wearing this type of glasses required four to six weeks' adaptation to use them effectively. Though temporarily grounded, Thornton would resume flight training at Randolph AFB in San Antonio, Texas. After the adjustment period, he completed the course without further delay as he was in the T-38 phase of the programme. When grounded he was close to completing the course and returning to NASA.